A river adventure for all. This rafting experience offers an insight into rafting surrounded by the beauty of New Zealand wilderness. We pair paddling the rapids with the right amount of excitement to get your heart pumping. Don’t be fooled by the relaxed nature of this trip, we aim to make each paddle as thrilling as the next. The grade 2-3 rapids may be perfect for first timers but as river levels change on the daily you should expect a gripping ride no matter what. There is plenty of rapid action, even the chance to swim through one and a brand new cliff jumping section. This river experience is the perfect adventure. Our guides will expertly get you from top to bottom, tackling the unforgettable 400m Dog Leg rapid – New Zealand’s longest commercially rafted rapid, before returning to base for a hot shower. Swimsuit and towel. Please leave your valuables behind. Wetsuit, wetsuit jacket, spray jacket, paddle, helmet, wetsuit booties and a life jacket. Enjoy a hot shower and a cold beer (if you’d like) down at Canyon Brewing Co.
"It was definitely more exciting and fun than I thought it would be"
1) Immediately after the rafting trip, I still feel how I wish the water rafting don’t come to an end so quickly! 2)It was definitely more exciting & more fun than I expected it to be! 3)Best bits of the trip was jumping into the water both from the raft and from the rocks! Overall, I would like to thank Go Orange for having such a professional team to lead all of us! Indeed, it was such a great safe rafting trip full of enjoyment for myself and my family members. Casey did a great job as our instructor, very organized, humorous, confident and very experienced. We loved his professionalism. To the whole team, thank you so much! "Amazing rafting in Kawarau river"
I hadn’t spent much time in open water so opted for this tour which was more gentle. I am now a fan of whitewater rafting, having particularly loved overcoming the major rapids. We had fantastic guides who briefed us thoroughly and helped us navigate the water. As expected we did not get thrown out of our rafts but we chose to jump into the swirling water just for a bit of fun! The scenery was stunning although of course we could not have cameras with us. I would highly recommend this activity and the company, who organised it as professionally as could be. Had a great rafting trip - Jones, Martin and Ricky (plus bus driver) made the trip enjoyable from start to finish. Great fun on the rapids - especially for my 62 year old dad’s first time rafting. They provided all the kit which kept us warm. Did appreciate the hot shower at the end. "Greatest rafting in New Zealand!!" This is so worth doing while in New Zealand especially in Queenstown. Thrills while looking at the beauty of New Zealand! 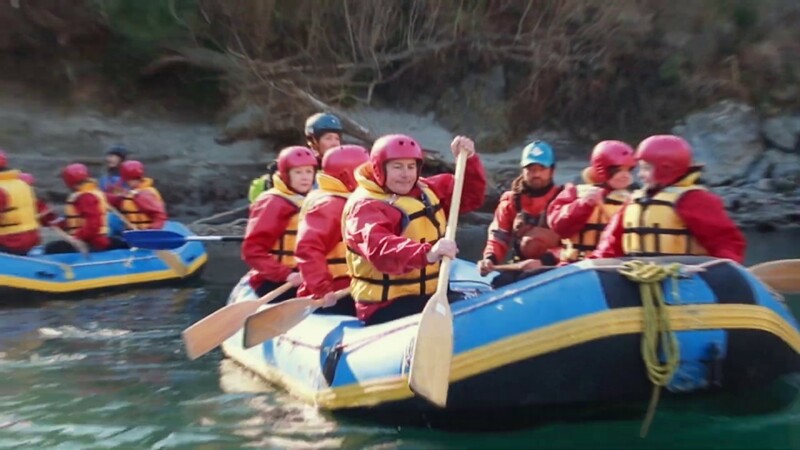 "Kawarau River, Great for beginners"
We went to the Kawarau River a few days ago, it was my first time doing rafting and I was really excited about it! The entire experience was Amazing! From the reception until the end. The guides and the guy in the kayak made us feel really safe, always there for us. The river doesn't have big rapids, but is fine if you are new, and if you are fan of the Lord of the Rings it is a big plus, because some shots were filmed there! Definitely , great experience! Next time I will do the Shotover!